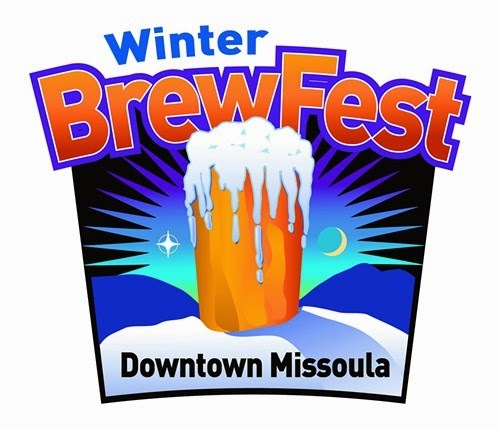 The 4th Annual Winter Brewfest, hosted by the Missoula Downtown Association and sponsored by Kettlehouse Brewing Co. and Qdoba, will fill Caras Park this Friday starting at 5:00 p.m., and with it comes a new layout and some new beers. In all, over 40 local and regional craft beers will be poured, from Prickly Pear from Lewis and Clark, beers from Homestead Ales, Winter Spiced Double Haul IPA from Kettlehouse, to All Souls Ale from Big Sky Brewing. Returning this year will be fire drums to keep everyone warm, but new this year will be rolling up the riverside tarp of the event space and moving the pouring table to the center of the pavilion (like it is at Garden City Brewfest). This should alleviate any of the "traffic jams" that occasionally occurred at last year's brewfest. "In addition to hosting three dozen microbrews from around the region, Winter BrewFest will showcase the musical talent and tasty eats that make Downtown Missoula a vibrant place to connect – even in the winter. Entertainment will be provided by The Idle Ranch Hands and food will be provided by El Cazador and Burns Street Bistro. There will be lots of ways to stay warm throughout the event." Admission is $12 per person and includes one 7-ounce commemorative glass and two beer tokens. Additional tokens are $1 each. Here's the beer list to-date. A printer-friendly version (PDF) is available from the MDA here.